You'd think these wines deserve better than such a bad pun. I could't help but notice the label spells out "Pinot Noir" for the US crowd. And indeed it is more Pinot than Bourgogne at first. Then it shows a mildly earthy character. For now, the 2008 greatly outshines it. Burgundy Wine Collection, 140 NIS. A perfumed, slightly minty nose that develops very nicely with only a little coaxing. The palate has ripe, solid acidity. There's a green, albeit tasty streak. I like it and I can see me fondling it over a meal but it doesn't bowl me over totally. Not imported to Israel, should cost somewhat less than 60 USD. A modern, extracted nose that overwhelms with vanilla and leather even after decanting. Very precise and friendly. The nose is powerful without being modern like the Duband and the aromatics are nicely complex. There's even a hint of brett and the palate has a fruity core deftly balanced by tannins and acidity. Expensive at 430 NIS at WineRoute but very tasty. Either corked or extracted beyond relief or otherwise spoiled by either man or weather. The nose is strange and while it gains clarity there's a wierd streak of brine. I find the palate is better and offers interest. Burgundy Wine Collection, 450 NIS. Complex aromatics of game meat, spices. Tannic, yet tasty and light. A very complete package. WineRoute, 380 NIS. Terrific value if you can still find it. Earthy and meaty, with etheral finesse. 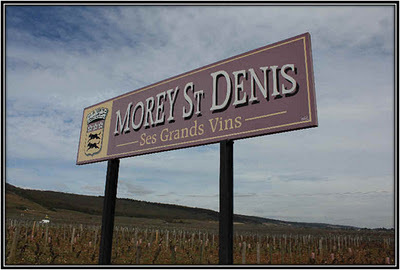 This is an idealization of Burgundy that relies on purity and elegance and, even, mystery. This, at 570 NIS, is a better value than the 2008 Aux Cheseaux. A different planet. The nose does offer fruit, but a dimension beyond purity of fruit: spices, sweat. The palate displays measured sweetness of fruit and marries power with elegance. Lengthy as well. The power here is implied rather than stated out loud. There's a warm, friendly elegance of sweet fruit at play and minerally, slightly pungent aromas. Each of the Grand Crus tonight offers a different aspect of Grand Cru-ness. This seems to me to be the most archtypical Grand Cru, that is, you can't say it's bigger or more intense or more elegant or more complex - it just feels like a Grand Cru. WineRoute, about 500 NIS at the time. Ripe fruit bordering on blue. So New World I can't bear it at this stage. Although I can sense the Bougogne she-lion sulking in the background. The palate is more delectable, but even it is more backward than any wine tasted. Stinky, brooding. No hint of over or under-ripeness. Tasty and that's all: grand deliciousness. WineRoute again, not sure about the price.